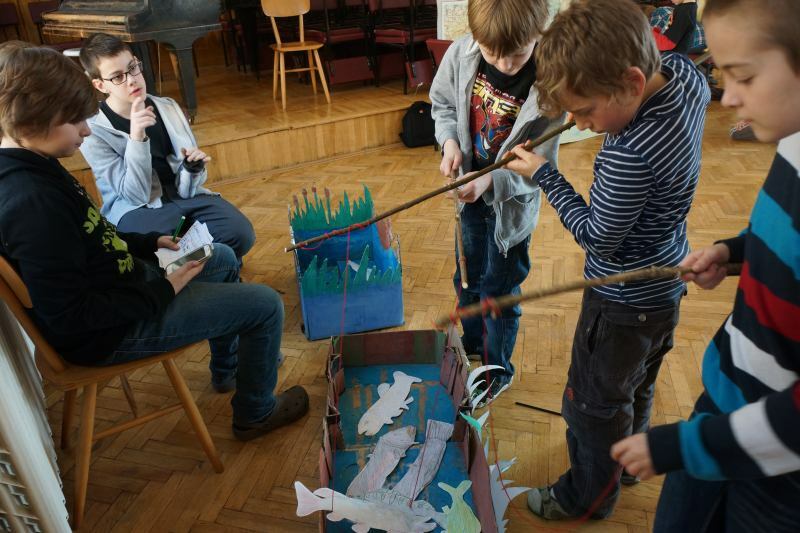 In this activity, pupils organized a fun game for younger schoolmates aimed at learning about the world of fish, fish species and fishing in the Czech Republic. Independently, they organized a competition, evaluated results and appreciated classmates. The aim of the activity was to prepare and hold a fun competition for pupils of the first to fourth grades oriented at learning about the world of fish. The competition tasks were focused on skills (catch a paper fish using a rod, throw balls into an open mouth of the fish, etc.) and knowledge (crossword, quiz, etc.). The activity was participated by 5.A (14 pupils) in Natural Science, Czech Language, Computer Science and Mathematics lessons. The preparation took the pupils several days. The pupils prepared the competition tasks in pairs, threes and individually. The very competition for children of the first to fourth grades was hold in the school gym. Every group that prepared a task than organized their task, wrote down the results (on smart phone or tablet), measured the time (by smart phone), evaluated the results (in Excel) and announced the results. After the competition, the pupils created diplomas and medals for the winners (made from biscuits and chocolate), and the final results were officially announced in the auditorium. Pupils solved tasks in teams, shared ideas, assigned tasks, etc. They communicated as teams directly in the class and at home after school. Pupils mostly needed encouraging, they did much of the work independently and decided on the next steps, some activities had to be managed by the teacher. Pupils manually created a series of tools for the competition from paper, wood, cubes, etc. They painted images on paper without using digital technologies. They used digital technologies only during the actual competition (measurement of time using a stopwatch on a smart phone, writing down the results of competitors on a smart phone or in Excel tables). They took photographs using smart phones and digital cameras. Pupils did not need any training in the use of digital technologies, they operate them on a regular basis. They evaluated the quality of their work (tasks and organization) between themselves and mostly based on the behaviour and reactions of competitors. During the activity, the pupils were mainly taught to cooperate, they deepened their knowledge in natural science, developed the ability to search for information from multiple sources and learned to communicate and work with younger classmates and to help them. In preparing the competition tasks, they tried to image what younger classmates already know or do not know so that they did not prepare either too easy or too hard tasks. I decided that we would play twister, but the children new different rules. We had problems with cutting the box. I had problem remembering all kinds of fish to be able to correct the children. Somebody stole my expensive pen. I told them to bring it back. We used a computer to see how fish looks in details. We didn’t use technics much, only to find where different kinds of fish live. I didn’t learn anything new concerning the Internet. I learnt how to work in Word. I learnt how to look for information and formulate questions. I would like the activity to be better organised. I think everything was perfect. I would like to have longer breaks and fewer children. I learnt how to cooperate and to be responsible. I learnt how to cooperate with children. I got a lot of information about different kinds of fish. I learnt how to work in team without teacher’s help. I improved my communication skills.